This chapter outlines the multidimensional and integrated nature of Gross National Happiness (GNH) and explores its roots in a foundation of Buddhist-inspired cultural values. 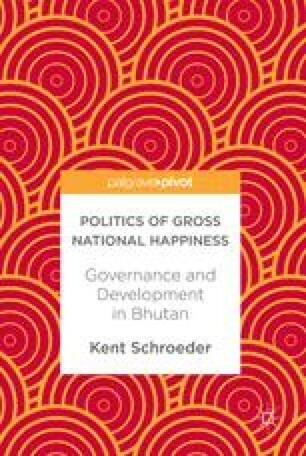 It argues that GNH is not only a national multidimensional development model for Bhutan but also a defining component of the image of the Bhutanese state itself, portraying an autonomous and coherent entity leading the pursuit of national happiness in partnership with Bhutanese society. Despite this image, the implementation of GNH policies is subject to the competing priorities and practices of the fragmented state and non-state governance actors involved. Braun, A. A. (2009). Gross National Happiness in Bhutan: A living example of an alternative approach to progress. University of Pennsylvania. http://repository.upenn.edu/cgi/viewcontent.cgi?article=1003&context=sire. Accessed 27 Apr 2017. GNH Commission. (2016). Twelfth five year plan guideline. GNH Commission. http://www.gnhc.gov.bt/12th-fyp-preparation/. Accessed 2 Apr 2017. Ura, K., & Kinga, S. (2004). Bhutan—Sustainable development through good governance. A case study. World Bank. http://documents.worldbank.org/curated/en/880451468743944567/pdf/308210BHU0Governance01see0also0307591.pdf. Accessed 12 Mar 2017.